The Men celebrated their return to form by producing a couple of good buns to celebrate Carl Maffei’ significant birthday, Carl is a legend in his own lifetime. 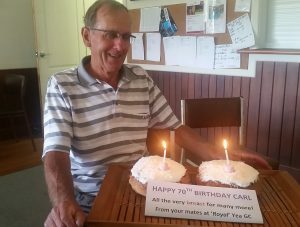 Happy Birthday Carl!! Ivor Brayley showed the boys (aka Men) how to do it today winning with a fine 38 points to narrow the Lady’s lead in our Summer MidWeek Gender Challenge. After today the ‘Boys’ only trail by a mere (?) 40 points, just one good round behind! With still another five rounds to play the banter around the Club is growing … which gender should be out buying the Cook Books – the Men or the Ladies! Whatever the final outcome we’re all enjoying our game and having a lot of fun at ‘Royal‘ Yea.